Good morning. World Tours. My name is Jamie. How can I help you? Good morning. I want some information on self-drive tours in the USA. Of course. Could I have your name please? Thank you. And your address? Thanks. And can I have your phone number? Thank you. And can I ask you where you heard about World Tours? From a friend? Or did you see an advert somewhere? No. I read about you in the newspaper. OK, I'll get the brochures in the post to you but can I give you some information over the phone. What kinds of things do you want to do on your holiday? I’m interested in going to California with my family. I’ve got two children and we want to hire a car. OK. We have a couple of self-drive tours there visiting different places of interest in California. The first one begins in Los Angeles and there's plenty of time to visit some of the theme parks there. That’s something on my children’s list so I'd want to include that. Good. Then you drive to San Francisco. From San Francisco you can drive to Yosemite Park where you spend a couple of nights. You can choose to stay in a lodge or on the campsite. I don't like the idea of staying in a tent. It'd be too hot. Right. And the tour ends in Las Vegas. The other trip we can arrange is slightly different. It starts in San Francisco. Then you drive south to Cambria. Someone told me there’s a really nice castle near Cambria. Will we go near that? Hearst Castle is on that road so you could stop there. Good. I'd like to do that. Does this trip also go into the desert? No, it continues to Santa Monica where most people like to stop and do some shopping. We have enough of that at home so that doesn’t interest us. Well you could go straight on to San Diego. That's good for beaches isn’t it? That’s right, that's a good place to relax and your children might like to visit the zoo before flying home. I don’t think so. We want some time for sunbathing and swimming. So how many days are the trips and how much do they cost? The first one I told you about is a self-drive tour through California which lasts twelve days and covers 2.020 kilometres. The shortest journey is 206 km and the longest is 632 kilometres. The cost is £525 per person. That includes accommodation, car rental and a flight but no meals. That lasts nine days but you spend only three days on the road. You cover about 980 kilometres altogether. So is that cheaper then? Yes, it's almost a hundred pounds cheaper. It’s £429 per person, which is a good deal. 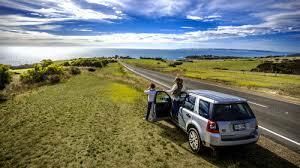 So that covers accommodation and car hire. What about flights? They aren’t included. But these hotels offer dinner in the price. Well, thank you very much. I'll be in touch when I’ve had a chance to look at the brochure. I’m pleased to help. Goodbye.